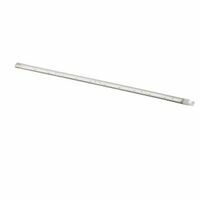 AmerTac Strip Extension Kit, Series: Westek, 12 V, 1.4 W, LED Lamp, 8000 hr Average Life, Warm White Light, 3000 K Color Temperature, Surface Mounting, Plastic, Includes: Mounting Hardware, UL Listed Slim line 3/4" profile. Can be used under kitchen cabinets, in display cases, workshops and more. Can be joined together or connected using the included linking cord. 3000K warm white light. Cool to the touch. Small and light-weight in size, but provides a substantial amount of diffused light. Equipped with dimmable LEDs that can be connected to a dimmer switch. In-line on/off switch. 5' power cord, 8" linking cord and mounting hardware included. Provides a warm, diffused light perfect for the home or office. Slim 5/8" profile tucks discreetly underneath cabinets and shelves. For underneath and inside cabinets, display cases, office lighting and work areas. Can be mounted virtually anywhere with a plug in. Simply turn on or off by pressing the attached rocker switch or connect the lights to a dimmer switch to adjust the brightness. Slotted holes allow for easy and seamless mounting directly through the housing. Diffused lens disperses the light to provide maximum coverage. Plug-in design, linkable. 4.7 watts, 420 lumens, 83 CRI, warm (3000K) white light. 5' power cord, 12" linking cord and mounting hardware included.